How do you heal a broken heart? By singing, that's how. Malawi's Fatima was a sight for sore eyes this evening, as she pined away for Elikem. The two were separated last night in a dramatic House swap decision made by Ruby Head of House, Selly. Fatima is clearly missing those cosy moments she and her Ghanaian beau shared when they lved in the same House. This evening in the garden, all Fatima could do was sing sad songs. What started off as a fun singing session quickly became tinged with sadness, as Fatima ran through tear-inducing love songs. The Malawian even remixed some of these songs, adding a few well-placed Elikem references. 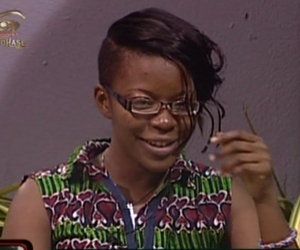 "I've got a feeling that Elikem will be back", she sang. Fatima really seems to be taking this separation hard, despite the smile she permanently has plastered on her face. We have a feeling Elikem is as gutted as his lady. Who can forget his plea to be brought back to the Ruby House next week?